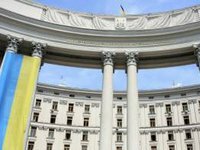 The Ukrainian Foreign Ministry has expressed its deep concern over the escalation of the Nagorno-Karabakh conflict and offered condolences to the families and friends of those killed and injured in the fighting, and called for a political solution to the problem. "Ukraine favors a long-term political solution to the Nagorno-Karabakh conflict on the basis of respect for the sovereignty and territorial integrity of the Republic of Azerbaijan within its internationally recognized borders," the ministry said in a Tuesday statement over the escalation of the Karabakh conflict. The conflicting parties and international community, primarily the co-chairs of the OSCE [Organization for Security and Co-operation in Europe] Minsk Group, must do their utmost to ensure an immediate ceasefire, de-escalate the situation and continue looking for ways to settle the conflict peacefully, on the basis of the generally recognized principles and norms of international law, the ministry said. These efforts will be helped by a special meeting of the OSCE Permanent Council in Vienna due on Tuesday, it said. "The current situation eloquently shows that frozen conflicts remain a hotbed of instability across the OSCE space, which could flare up any moment and lead to large-scale hostilities and a great loss of human life," the ministry said.